Isn't it odd how something seemingly small can make such a difference to your life and your happiness? I've made no secret over the last year and a half that I have not been in a good place, suffering with depression and various illnesses that have affected me both physically and mentally. At first I felt ashamed that I was allowing myself to be overcome and changed by them, but then I realised that most people go through this at some point in their life and to help depression and anxiety be better understood the best thing to do is be open and honest about it. My mental health not only affected my mood and my relationships but also impacted me physically - my hair was falling out, my skin was sallow and covered in acne and I pretty much felt like I lost my identity and spark. It's been a long road to recovery and I'm still not at the finish line, but a few months ago I did something which didn't seem like a big deal at the time but ended up pushing me round a corner on to what feels like my final path to recovery. I know it might sound stupid and perhaps immature and even a bit vapid, but dying my hair auburn has been a genuine game changer for me. It's a colour I've never tried before and after years as a platinum blonde then forced to go jet black when my hair began to fall out it's a revelation. To my eyes it makes me look like I have so much more vitality and strength and I smile every time I freshen it up! I do it myself with Live Colour 030 Mango Twist by the way! 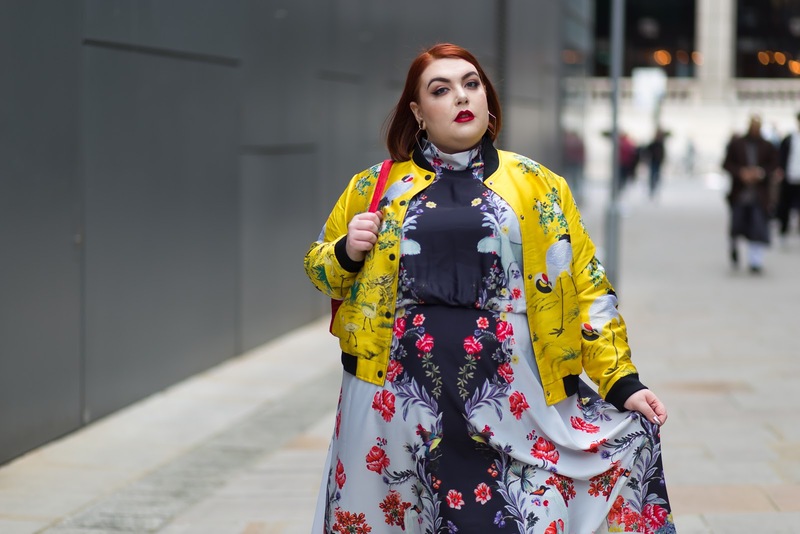 I finally feel myself again after nearly two years of being trapped in what felt like a strangers body and I wanted to celebrate this realisation with a fabulous outfit that is the epitome of what I see as my personal style. 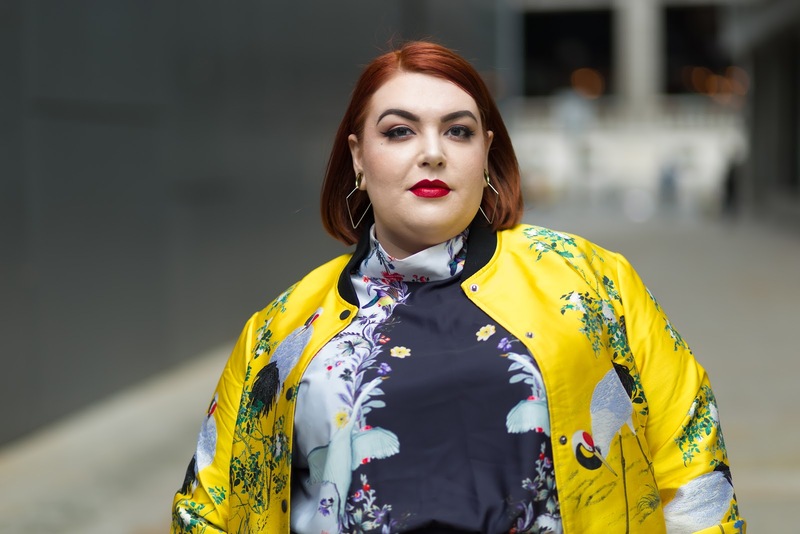 Its well known that I love juxtaposition when it comes to fashion - mixing high glamour with the super casual, classic cuts with contemporary prints, bold colours pops with deep blacks - all with a slick of lipstick and a flick of eyeliner of course. This outfit sums all that up for me, the prime example being this stunning Midi Dress with Placement Swan Print from ASOS Curve (£55.00). 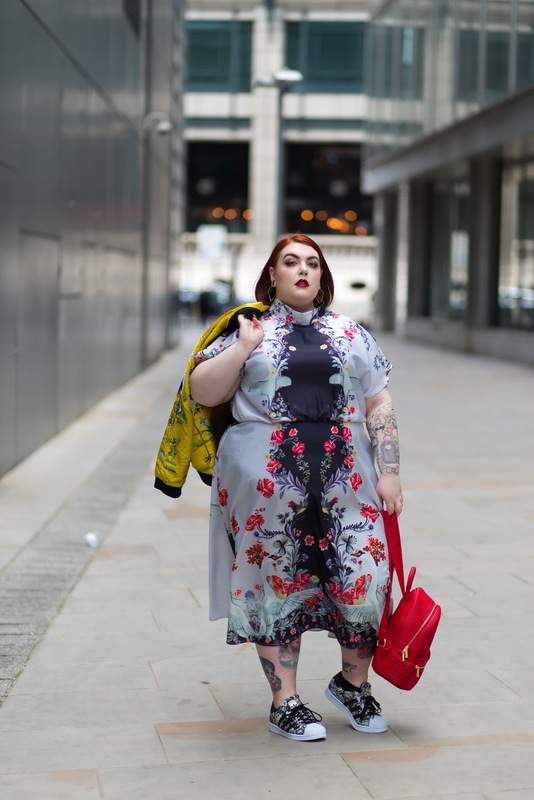 The classic relaxed fit satin dress is given some gorgeous updates here with a high neck, an open back and a truly eye catching mirror style print in black and grey with bold pops of red, yellow and purple. 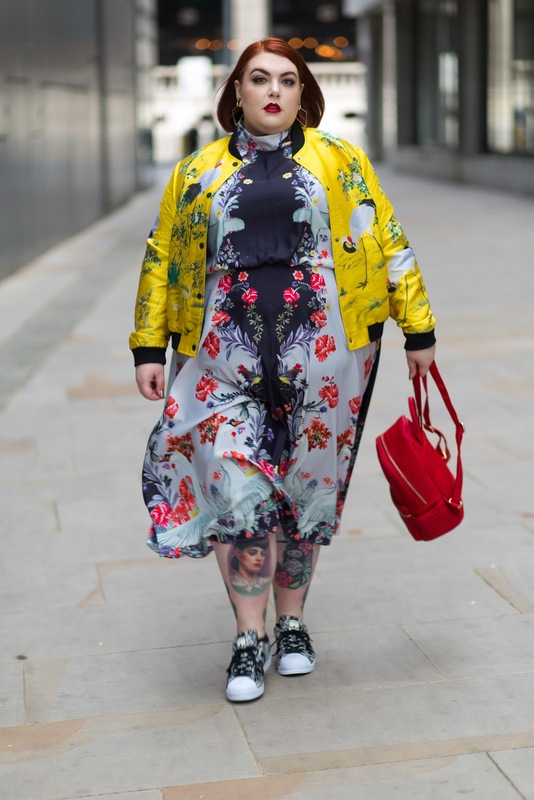 The swan and flower details remind me so much of beautiful oriental damasks and whereas I would likely wear this more often than not with plain accompaniments I knew that my new Embroidered Yellow Jacket from Violeta at Mango (£89.99) would be its perfect partner here. 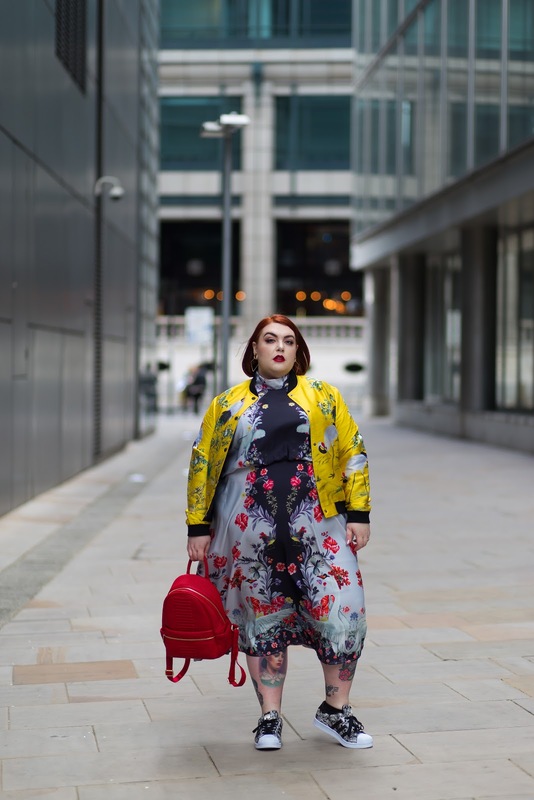 I am literally obsessed with this jacket as it's such amazing quality, so bold and feels like the kind of thing I would usually see in regular sizes and only dream about owning in plus size - mega props to Violeta for this one! 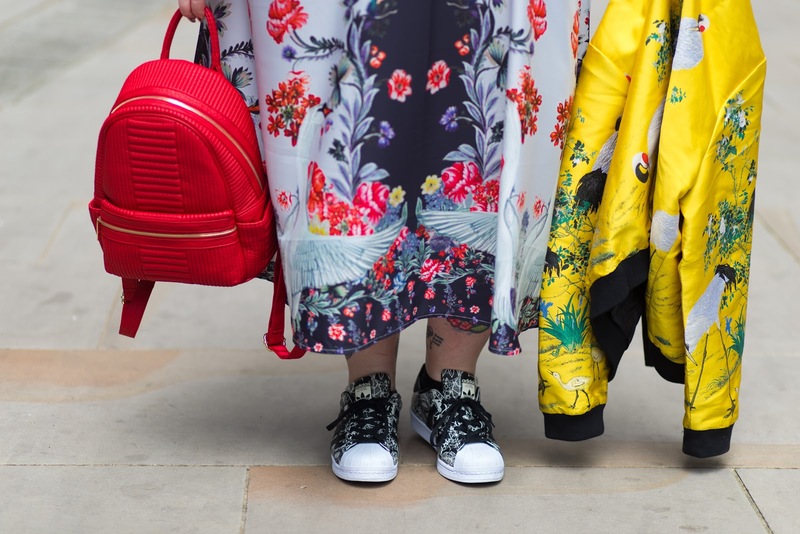 Accessories wise I went with my favourites - earrings, trainers and a bright bag. As you can see my ears are stretched and therefore I can't wear most earrings, so when I spot something unusual like these Diamond Shaped Hoop Earrings from Marks and Spencer (£5.00) that I can just thread through my tunnels I grab them straight away. Shoes wise I went for trainers of course, but these adidas Originals Lace Print Superstars (£75.00) are a new style for me that I'm head over heels for thanks to Dani's wide fit trainer recommendations! 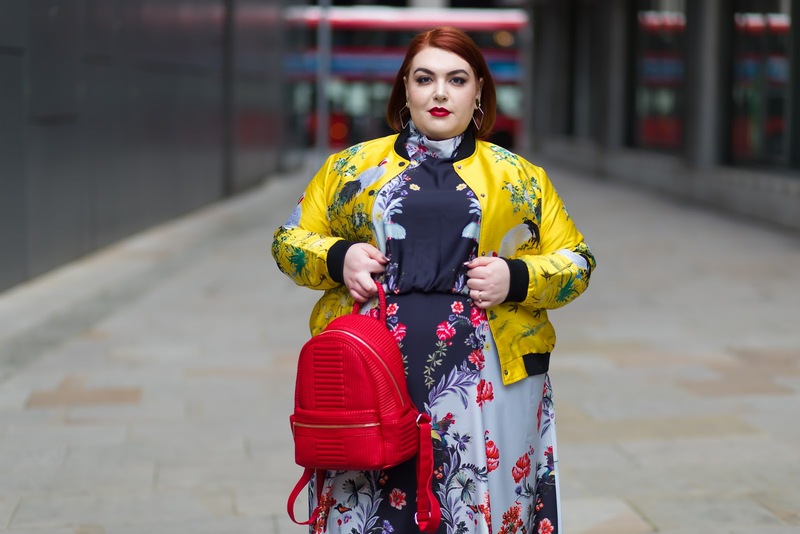 Finally to carry around all of my stuff and to add a final explosion of colour I added a Red Quilted Backpack from V by Very (£28.00) that is not only super cute but really practical for a day walking around the city, which just happens to be one of my most favourite things to do.